Our experience this Christmas will be entirely new - a tropical climate without snow, joining hands with family and many friends throughout the world over the internet. Clear night skies are now filled with twinkling stars, waves are rhythmically lapping at the shore, and our glasses are still filled with a Chilean Merlot, but there will not be any wonder of snow or placing another log on the fire. We can still enjoy a swim in the Pacific Ocean, and then relax in the hammock in the afternoon .... it seems so strange how soon we seem to have forgotten about winter ! Today I almost caught a large fish in my mouth as it leaped out of the water and directly over our boat. We have not had rain in the last eight months, and this was becoming problematic for crops and farmers. In just the last several days a gentle rain has begun to fall here at night. Yesterday we were gardening to the music of Christmas Carols from the local park. Christmas is an important religious festival in this predominantly Catholic country, with a strong focus on the presepio or manger. 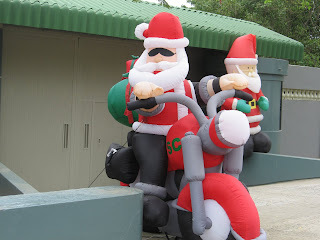 Santa Claus is not very well known and it is the " christ-child " that brings their gifts. Similar to western countries - highly commercialized in the big cities, with christmas decorations in evidence from October onwards and festive music in the shops. Escape to the rural communities for a more peaceful Christmas without the shopping hype. Christmas trees, gifts and dinners are in every family in Ecuador. 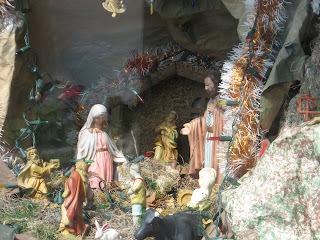 We have been very surprised as Nativity scenes and Christmas decorations lights etc are plentiful here and up much earlier than back in Canada. Actually with the country's electrical shortage - we continue to experience daily 3 hour blackouts - all the decorative lighting is somewhat ironic. In fact a simple bamboo cane hut on the mountainside, we didn't think even had electricity, is beautifully lit at night. Nine days before Christmas traditional novenas - Catholic prayers and "house tours" began the holiday season. 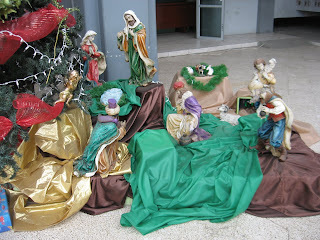 Elaborate Nativity scenes are set up in local barrios, churches, and individual homes, where they all seem to have spent months trying to outdo each other in their presentations. Directly below our house is our barrio's nativity scene where each evening neighbours gather to recite prayers to the Holy Infant and sing. 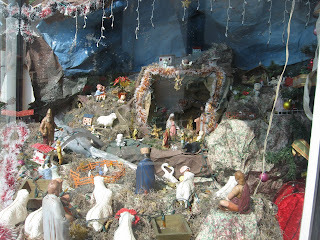 Ecuadorians visit other homes during this time looking at the nativity scenes. Walking anywhere in Bahia de Caraquez the last week has been a magical treat, from the nativity scenes, twinkling Christmas lights adorning houses, balconies and trees, magically lit palm trees, and Christmas Carols floating through the tropical evening air. Celebration is unique and the mood is clearly festive. Churches, Schools, Universities, and various associations have held Christmas celebratory events with music, food, and dance. Children place their Christmas lists into an old shoe or write letters to baby Jesus explaining how well behaved they have been this past year, along with their gift requests. Christmas day starts at midnight Christmas Eve with the Christmas family dinner - chicken, turkey or pig and pristinos - cinnamon pastry, and visiting relatives and friends. The twelve days of Christmas starts December 26th, they are the twelve days from Christmas until the beginning of Epiphany - January 6th. Here in Ecuador, and throughout South America, they are more strongly celebrated than in North America… each day very rich with meaning. Christmas Day is the day of giving gifts. Caspar, Melchior, and Balthasar saw that Christ would be a King, a Physician and a Priest and the gifts send the message for us to have balance in our lives. Caspar brought Gold for the King as a symbol of abundance. Melchior offered Frankincense to the Priest within the Child which signifies wisdom. Finally Balthasar carried precious Myrrh for the Physician that this Wonder Child would be… the symbol for prophesy. We should learn to take care of our wealth, look after our health and maintain a positive moral spirit.On Christmas day the children usually will find new shoes and their presents. Sweets and biscuits are given in huge quantities, and seem to take up most of the space in supermarkets during the holiday season. Although presents are exchanged they are usually token gifts rather than extravagantly expensive purchases. Very few wrapped gifts are received, a bag of animal crackers and sweets is most common for children. In Quito Christmas festivities start right after Quito's birthday - December 6th continuing until the new year. Not much work happens for this several week period. In the Andes a more traditional Christmas Day is a colorful procession of the Indians who live and work in the highlands dress in their finest clothes and ride their brightly arrayed llamas down to the ranches where their employers live. They bring gifts of fruit and produce, which they lay before the Christ Child in the pesebre, or manger. Children also bring their gifts and make speeches to the Holy Infant, asking blessings for their family and their animals. Then there is a fiesta with much singing and dancing outdoors. The hacienda owner distributes gifts to the employees and their families. A huge feast will be enjoyed consisting of roast lamb, baked potatoes and brown sugar bread. As in North America there is always too much to eat, so that the processions that wind their way into the mountains at the end of the day, are as heavily laden with leftovers as they were with offerings in the morning. The musical installment (Rondador) is made of bamboo and comes from the mountain regions. The fans (Aventador) are found all over Ecuador and are made by the local indigenous groups. The Santa basket is made from straw and is a common ornament. The straw ornaments are used for several other festivals during the year. The colors of the decorations signify the festival. And in the highland University town of Cuenca known throughout Latin America as the City of Festivals, not a week goes by without some sort of celebration. A must-see pageant of color and culture, the granddaddy of them all, is El Pase del Nino, the Christmas Child Procession known throughout the continent. This Christmas tradition begins at 10.00 a.m. every Christmas Eve and finally eight hours, thousands of floats, hundreds of bands, and 100,000 participants later, it ends, delivering the baby Jesus to his manger in the Old Cathedral for the Midnight Mass. This is a traditional Christmas drink recipe from Ecuador, much like eggnog. the milk. Boil again. Remove and allow to cool. Add the Aguardiente. Place the drink in a bottle in the refrigerator.